All 7 Project Summary Forms (PSFs) within the 2nd call submitted in electronic Monitoring System (eMS) successfully passed Administrative Eligibility Check (AEC) and now are on the stage of the Quality Assessment. 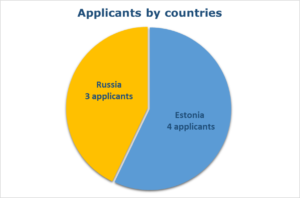 The importance of the joint Estonia-Russia actions to solve the common problem had caused the decision of the Joint Monitoring Committee (JMC) to launch 2nd call focused on the Programme specific area `Fostering shared actions in risk management and a readiness to cope with environmental disasters`(under the Thematic Objective 6 “Environmental protection, climate change mitigation and adaption”). 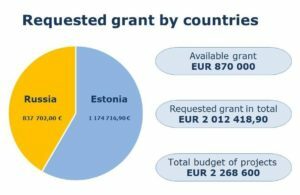 The total of EUR 2 012 419 were requested in 7 PSFs submitted by the deadline with Programme financing allocation of EUR 870 000. The activities proposed in the PSFs by cross-border partnerships are aimed to bring solutions to the scope of problems related with environmental disasters, including forest fires monitoring systems and opportunities for warning of the population in case of disasters, promotion of wider public awareness about forest fires protection measures. The total of 37 organizations are involved in the projects, both as partners and associated partners, including local municipalities, volunteering fire-fighting teams, regional administrations, scientific and educational institutions, state fire-fighting organizations. Such wide scope of organizations promoting different approaches for the problem tackling gives way for seeking most suitable solutions. Within the course of AEC some shortcomings were identified by the staff of the JTS in 6 PSFs, after required written clarifications all 7 proposals according to the decision of the Programme’s Joint Monitoring Committee were presented to the Selection Committee for quality assessment. 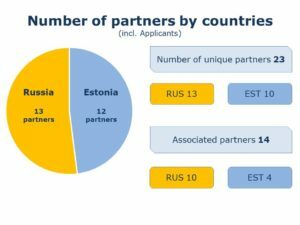 – mid December 2018 – FAF submission deadline in eMS.